Few years ago, something went wrong with MTN and some smart tech guys started enjoying 100% free browsing and downloads on their MTN SIMs. I was chanced to enjoy this on my MTN SIM back then for a couple of days before it was blocked and patched. Though, the smarter guys used it for weeks and even months back then. Now, if you also want to be among the smart guys then you should make the move right away because right now as I'm typing this post, the MTN magic SIM is back again and it is exactly what I'm using to surf the internet right now. You are still not getting the gist? Wait, let me take few minutes to explain better. 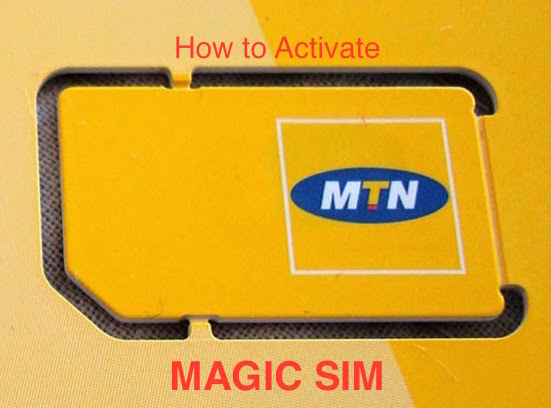 The MTN Magic SIM activation is a method where you kind of soft-hack your MTN SIM card to make MTN think you are using a paid unlimited subscription, with this hack on your SIM, you'll be able to browse unlimitedly, download with no limits, live stream a whole football match, as well as watch online TVs. Interestingly, you'll be able to use this SIM to browse on any device - be it your PC, Tablet, Smartphone and so on. For simplicity sake, it works on Windows Phone, Android devices, iPhones and BlackBerry 10 Smartphones. I've not tried it on BlackBerry 7 devices so I don't know if it's working on these. Now that you have a clearer view and understands what the MTN Magic SIM is, are you ready to turn your SIM into a magical one? Well, here you go! => Recharge your MTN SIM with #250 worth of airtime. You can also transfer the #250 to your MTN SIM. Just ensure you have #250 in your main balance. => Dial *131*1*4*1# to subscribe to the MTN 2Hrs data plan, the #250 will be deducted immediately from your SIM. => Now, remove the SIM from your phone and keep it for 24 hours. I know 24 hours is much for you but you just have to do it that way if you want to enjoy unlimited surfing and downloads on the SIM. => After 24 hours, insert the SIM back into your Phone or Modem and start surfing & downloading unlimitedly. 1. You may receive a message that "Your subscription has expired and blah blah blah", just ignore the message and keep on surfing and downloading until you get tired. 2. If the SIM refuses to browse after following the procedures listed above, ensure you have web.gprs.mtnnigeria.net as the Access Point (APN) on your Phone. If it still persists, try the steps all over again or just get another MTN SIM to activate it on. It worked for me, I'm sure it'll work for you too. Now, I've been using the MTN Magic SIM for 4 days now and I've downloaded and surfed to the fullest. You should also enjoy this while it last since we don't know how long it will last, a month, few months or probably a year. If you have any problem or questions related to the activation of the MTN Magic SIM. Don't hesitate to ask, you can make use of the comment box just a bit below to drop your questions. If you've activated yours successfully too, please show appreciation by dropping encouraging comments, better still, share this post with your friends and family. To get informative posts and updates like this directly into your mailbox, kindly subscribe here. It's FREE! Enjoy your Weekend. Hi Patrick, good to know that you are also interested in Blogging. You can mail me for better discussion on how I can be of help. Cheers! It's not going to work for you! It has even stopped working here in Nigeria. Cheers!